Roy Lee McCarty was known for his love of fishing, his family and his two dogs. He worked for 11 years at the commercial grain elevator that in 2011 was fined more than $30,000 by the Occupational Safety and Health Administration. The fine was for seven serious violations from an incident when a worker had to be rescued from a grain bin at a different Premier Cooperative facility in Jamaica, Ill.
His death marked the first grain-bin fatality for Illinois this year, but with expected large crop yields coming, more farmers may be at risk. An NPR investigation earlier this year, “Buried in Grain,” found that nearly 180 people have been killed in grain-related entrapments at federally-regulated sites across 34 states since 1984. 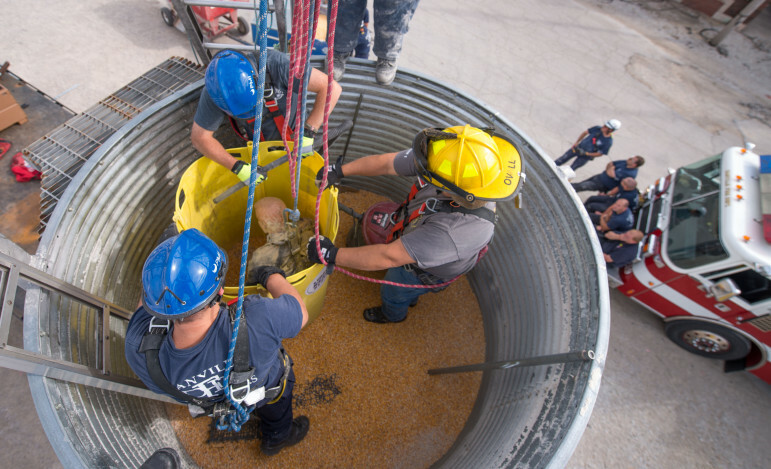 Firefighters practice placing a rescue tube during grain bin rescue training at the Danville, Ill., Bunge facility on Sept. 17. There have been more than 900 grain-bin entrapments throughout the country since 1964, according to data compiled by Purdue University’s Agricultural Safety and Health Program. More than half of those incidents were fatal. Illinois led the country with 10 documented grain-bin fatalities in 2010 – a successful harvest year. With last year’s harsh drought, Illinois had only one grain-bin fatality. So far this year, farms in Georgia, Illinois, Indiana, Iowa, Nebraska, Ohio and South Dakota have reported grain-bin deaths or injuries. Suffocation from entrapment is the leading cause of death in grain storage bins, but it isn’t the only risk. Wet grain can ferment in bins and release noxious gases. Very fine and dry grain can ignite and explode. Grain dust can cause serious problems for workers if it gets inhaled into their lungs. While many safety standards exist to prevent grain-bin incidents, there is one recommendation that – in theory – prevents all fatalities. Many safety organizations, including the Occupational Safety and Health Administration and agricultural extension programs alike, tell farmers to stay out of grain bins entirely. “We recommend that they don’t go into the bins at all, if at all possible,” said Aherin. Officials in the grain handling industry say that always staying out of grain bins isn’t realistic. Jess McCluer is the Director of Safety and Regulatory Affairs for The National Grain and Feed Association, a non-profit trade association that represents and provides services for grain, feed and related commercial businesses. The association represents more than 1,000 companies, which handle a combined 70 percent of all U.S. grain. McCluer said going into grain bins is simply part of the job. “Moving grain” and “walking the grain” are, at times, necessary risks. Very dry grain funneling out of bins creates quicksand-like hazards for grain-handlers working inside them. Workers also need to enter bins to break up grain when it solidifies from excess moisture. Similar to wet sand, grain sticks together when it’s moist, a phenomenon known as “bridging.” When grain bridges, it sometimes sticks to a bin’s side in clumps. Workers then need to go into the bin and poke or prod the bridged grain off. Workers are occasionally injured or killed in “avalanche” instances when bridged grain on the side of bins collapses on top of them. Walking the grain can be like walking on thin ice if the top layer has bridged from moisture. Illinois is the country’s second leading producer of corn and soybean. In 2010, Illinois farmers grew about 1.9 billion bushels of corn and about 466 million bushels of soybeans, according to U.S. Department of Agriculture data. At least 67 Illinois workers have died while working in grain bins since 1986, according to Illinois extension records. Workers have died falling from 90-foot silos onto concrete floors, and others have been crushed, electrocuted and maimed in grain bins. Grain bin safety records show that almost all Illinois grain-bin-related incidents have involved men. Some have been as old as 81, and others have barely been teenagers. In 1992, a 45-year-old man in Carroll County was working with an auger used to mix grain when it collapsed and fell on him. Four others from Carroll have died when working with grain bins since 1986. One was a 14-year-old boy. In 1998, a 38-year-old man from McLean County was electrocuted when coming into contact with a live wire in a grain bin. In 2011, an 81-year old man from Clay County was cleaning out his grain bin from above when he fell inside and died on impact with the concrete base. OSHA still is investigating the Sidney Premier Cooperative facility incident from July. Because the investigation is ongoing, Roger Miller – the chief executive officer and general manager of Premier Cooperative – said he could not comment on McCarty’s death. However, he said grain bin safety should be the number one priory for all farmers and commercial grain elevators. He said Premier Cooperative has had the zero entry policy for about three years. In 2011, Miller said the violations and fines were issued because somebody entered a grain bin and didn’t follow company safety policy. Structural challenges are one reason why farmers risk their lives by entering grain bins without effective lifelines to save them, Aherin said. A lifeline system works by securing the grain handler to a fixed anchor point by using a harness and rope. To be effective, the anchor point needs to be able to withstand at least 1,800 pounds of force. The rope needs to have a belaying device that stops the handler from falling more than two or three feet. Additionally, the anchor point needs to be positioned somewhere that allows the rope to hang vertically to allow for minimum slack. Many grain handlers tie off their harnesses to ladders, said Aherin. Ladders don’t have the structural integrity of a specially-designed anchor point, and tying off to a point on the side of a bin allows for too much slack compared to an anchor point positioned directly overhead. “You don’t want too much slack because if you fall through, all that rope is going to do is help people find a body,” said Aherin. 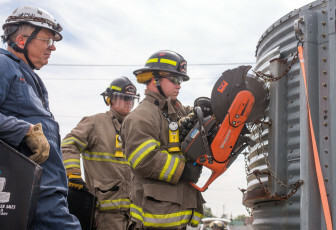 Firefighters learn how to cut grain relief slots during grain bin rescue training at the Danville, Ill., Bunge facility on Sept. 17. Many lifeline systems don’t meet these performance requirements. Likewise, many grain bins don’t come equipped with working anchor points. Grain bin manufactures have only recently started installing anchor points on bins. That means newer bins may be safe, but thousands of older bins still in use are unequipped. Aherin said another major reason why handlers continue walking the grain unprotected is psychological. The American Society of Agricultural and Biological Engineers began working on improved grain-bin design standards in November of 2012. The improved standard will “direct bin manufacturers to include interior anchorage points to which safety equipment can be attached,” said a news release issued by the society. Even though accidents continue to happen, McCluer said the grain-handling industry is currently safe enough. 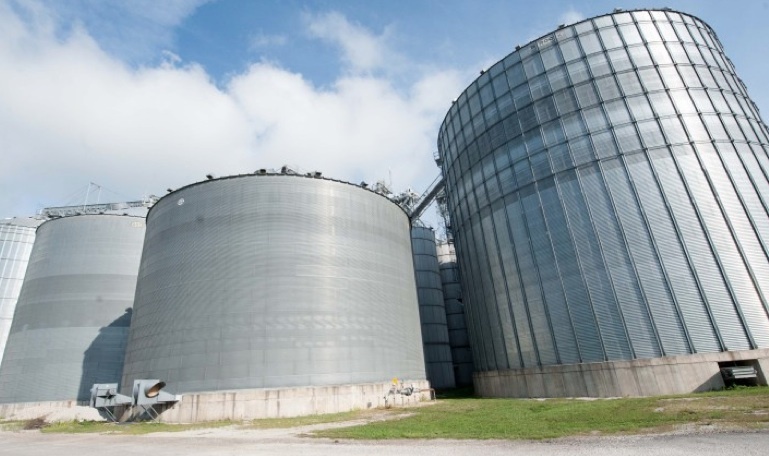 Grain bins, a common sight for anyone traveling through Iowa and other corn belt states, are a source of concern for agriculture safety specialists. Lack of research means specialists are unable to provide consistent advice to farmers about working in the storage bins.